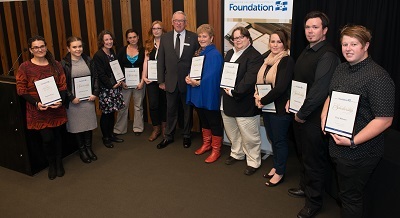 Federation University Australia Foundation had pleasure in awarding 18 scholarships of $7000 each in 2016 including one Ian Alexander Gordon Scholarship and one Carol Lynette Grant (Prowse) scholarship, two Gippsland Education Precinct Bursaries and one Brian Mackenzie Gippsland Bursary. 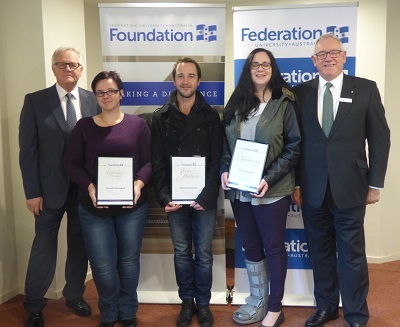 The Foundation made the scholarship presentations at the Mt Helen campus on Tuesday 3 May 2016 and at the Churchill campus on Wednesday 15 June 2016. From left: Deanne Hayes; Bethany Harrison; Erin Mitchell; Katrina-Louisa Beer; Tara Schultz; Dr Paul Hemming, Chancellor; Jill Philpotts; Joshua Callander; Rebecca Bredin; Nathan Finley; and Troy McLean. From left: Dr Harry Ballis, Head of Campus, Gippsland; Danielle Brandon; Harrison Carter; Kristie Russell; and Dr Paul Hemming, Chancellor.